What a brilliant idea was had by Dell'Arte Opera Ensemble to base their 2018 season on two contemporaries--Mozart and Salieri. There has been a centuries old rumor that the latter poisoned the former out of envy. The most recent iteration of that rumor was Peter Shaffer's 1979 play, later adapted for film. That the rumor has been disproven has not prevented writers from developing the idea dramatically. Pushkin wrote a verse drama in 1830 based on this rumor, which Rimsky-Korsakov set to music in 1897. Although this Russian genius wrote about 16 operas, we have only seen two prior to last night--The Snow Maiden and The Golden Cockerel. We have no idea why his operas are rarely performed in the United States and are thrilled that Artistic Director Chris Fecteau brought this one to our attention. The moral behind the tale rests upon whether genius and villainy are incompatible. Listening to tenor Gabriel Hernandez and baritone Nobuki Momma bring Rimsky-Korsakov's rich music to life, and watching the interactions between the two men, was an enriching experience. We wished that this scene might have opened the program Vignettes from Vienna instead of closing the program because it might have brought new insights to the other three scenes which we will describe anon. Jason Goldberg directed this one-act opera with a sure hand. Mr. Momma clearly limned the embittered character of Salieri who labored mightily to achieve his post at the Imperial Court Theater of Vienna; how envious he felt over the boy genius Mozart whom he described as "unworthy of his genius". Mr. Hernandez did well at bringing the carefree Mozart to life; we wished he had been a little more outrageous in his portrayal. Both men handled the Russian well. Chris Whittaker conducted with Dura Jun at the piano, doing a swell job with Rimsky-Korsakov's marvelous music. It was clever to show the attitudes of the two composers as they introduced their works with silent gestures. The opening entry was an excerpt from Act I of Mozart's Cosi fan tutte, following a very brief excerpt of Salieri's prior and failed attempt to set DaPonte's libretto. Desiree Baxter directed Mozart's scenes with a great deal of invention; we believe that singers make the best directors for several reasons but one is that they don't put the singers into positions that interfere with the vocal production! The set comprised several doors and the two sisters interrupted a board game they were playing to open two of the doors to reveal their suitors. Although tenor Vincenzo Catarisano and baritone Jay Chacon (a Dell'Arte regular) did well as Ferrando and Guglielmo, we were most taken with the voices of soprano Heather Bobeck as Fiordiligi and mezzo-soprano Andre Howland Myers as Dorabella. In the trio "Soave sia il vento", the sisters were joined by the young bass Ian Joyal who produced some fine Italianate sound as the cynical Don Alfonso; the vocal blending was entirely captivating. Nicholle Bittlingmeyer made a spunky Despina and added to the fun. The stylishly costumed Whitney George conducted with panache. The other Mozart on the program comprised excerpts from Act II of Nozze di Figaro. Soprano Maria Servodidio sang Countess Almaviva's "Porgi amor" with dignity and despair. Her voice has a wide vibrato which gave an interesting depth to her portrayal and lent distinction between her sound and that of Makayla McDonald who portrayed the spunky Susanna. Dell'Arte regular SarahAnn Duffy had the travesti role of Cherubino and had great fun portraying a boy who gets dressed up as a girl and tries to walk in high heels. (Oh, those racy 18th c. Viennese!) We wished she had paid a bit more attention to Ms. George's baton since she was not 100% on the beat. 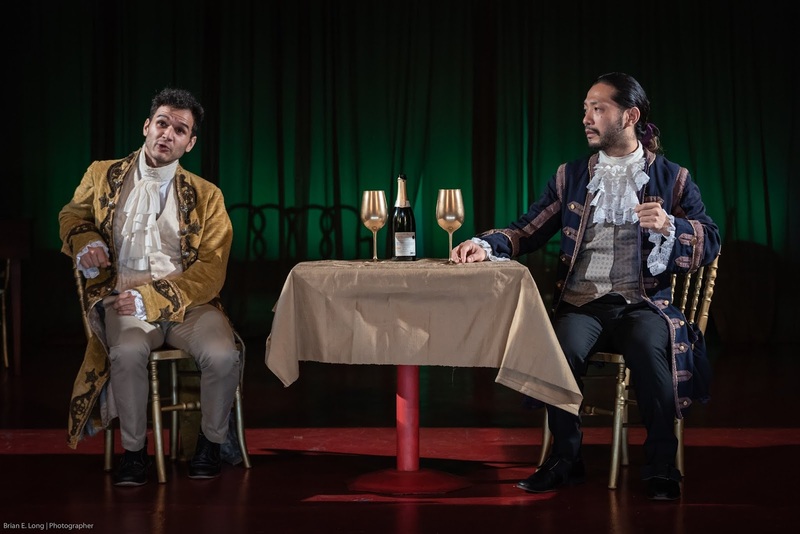 Lyric baritone Sung Shin made a huge impression as Count Almaviva, singing with gorgeous Italianate phrasing and a most pleasing vocal quality. Mr. Chacon reappeared as the wily Figaro. Ms. Baxter directed and Ms. George conducted with Ms. Jun at the piano and Maestro Fecteau playing the recitativi at the harpsichord as they did for the Cosi. Representing Salieri's contribution to the evening were excerpts from his Falstaff which we reviewed four years ago at Dell'Arte Opera Ensemble's 2014 season. Chris Whittaker conducted with sensitive hands and no baton. Of course there are reasons why Verdi's version eclipsed that of Salieri but the latter's opera is very worth hearing. We enjoyed the warm tenorial sound of Charles Calotta, which we so admired at Amore Opera, in the role of Mr. Ford. As Mrs. Ford we liked the bright soprano of Elise Kakacek. The versatile Mr. Chacon portrayed Mr. Slender with the indignant Mrs. Slender sung by mezzo-soprano Inbal Milliger, who gave us a marvelous aria portraying Falstaff in the most unflattering terms. The role of Falstaff was taken by bass Hector Mori with bass Will Esch as the ill-used Bardolfo. Matthew Iacozza's set design for the evening was simple--the aforementioned doors were put to good use and not much else was needed, save for a few random pieces of furniture. Heather Denny's costumes were contemporary streetwear for the most part with Mozart and Salieri sporting those 18th c. coats that make men look ever so dashing. Lighting was by Rafa. Tonight is a wonderful opportunity to catch Salieri's La Cifra, which we heard is hilarious. Tomorrow you might have a chance to get seats for Don Giovanni but better hurry because last night was a sellout.